Loss prevention by a bell? 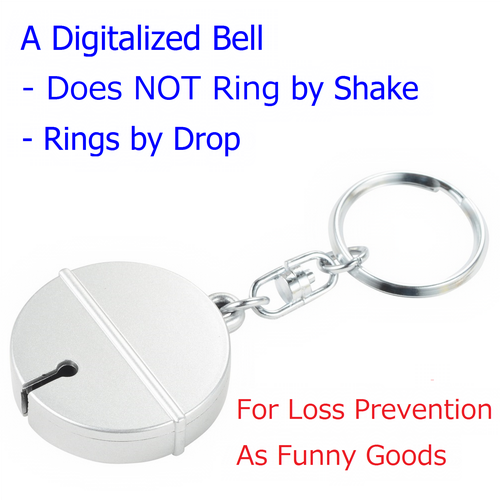 Do you have an experience to attach a bell for loss prevention? or you could not notice the drop. What if we have a bell that does not ring by shake but rings for a while by drop? DENSHISUZU is a bell like that. Patent pending, Utility model registered in Japan. For prevention of loss by drop. ※DENSHISUZU cannot prevent the loss by leave. 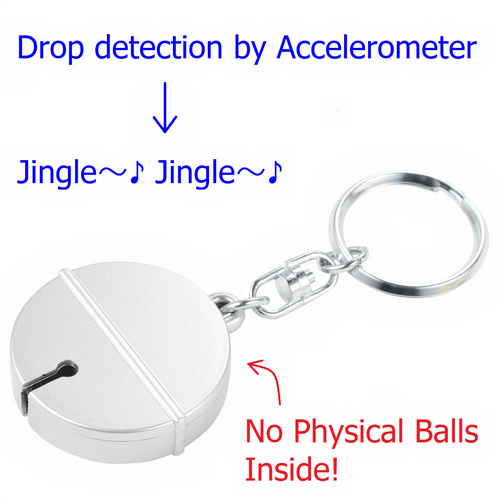 When the drop is detected by an accelerometer, the bell sound is generated as Jingle～♪ Jingle～♪. DENSHISUZU does not ring by shake but rings by drop. ※DENSHISUZU may ring by bump. No connection to a smartphone is required. →Can be used for goods that will not always be carried around. →Does not affect the battery life for smartphone. As soon as you drop your belonging, it will be detected. Bluetooth loss prevention tag cannot detect the loss until it gets far away. react to what they see for the first time. As a topic of discussion. When topics run out in conversation. For date, for business, etc. They should get interested. International shipping is available only at A-VEKT Store. The simplest solution for loss prevention. Links with a smart phone. There exists various types of tags. i.e. a very thin tag, a tag equipped with sound generator, a tag equipped with a button, etc. This type of tag cannot connect to a smart phone and dedicated master device is required. The radio law differs depending on the country and needs to be attended. using the GPS on the mobile phone. If you attach a bell to your belonging, you may notice the drop. However the noise will be generated if you move. Also you may not notice the bell sound generated by the drop. DENSHISUZU generates the sound when it is dropped. So you can immediately find the lost item. Left a smartphone at a restaurant. automaticaly by the loss of connection. A Bluetooth loss prevention tag equipped with a button can call a smartphone. if you did not notice shortly. Calling to a smartphone is better way than this. You may also use a service to find the smartphone that is provided by the operator. Left a wallet at a restaurant. several meters from the in restaurant. You should remember the location you were and it will not take time to find. Drop of a key at a road. it will be not easy to seek. the tag location but the sound will not reach 50 methers. If you use DENSHISUZU, you can find the dropped item immediately. The Bluetooth tag that reachs only 10 methers is also available. However link loss may happen due to Bluetooth radio issue. Lost key of bike that is used occasionally. If you do not usually carry the bike's key, the Bluetooth loss prevention tag is not suitable. they usually do not carry around or always carry around. Loss of key shared by multiple people. it is possible to search for keys using GPS information. In this case, you can not use an alarm by the link loss. If you use a DENSHISUZU, you can quickly find the drop. If you lose it at home, you will often come out if you search. If you lost it in a restaurant, you often find it when you call the store. If you have lost it by train, you may find it when you call the train company. What would you do if you dropped it on the street? If you are lucky, it will arrive to a police box, but no one may deliver it to the police box. If you use a Bluetooth's loss prevention tag, you need to seek a certain range. Radio wave is unstable in the 2.4 GHz band. The radio waves used by Bleutooth are the same 2.4 GHz band as the microwave oven. Radio waves of this frequency are well absorbed by human body containing moisture like microwave radio waves. It is also easily obstructed by obstacles such as metal. Furthermore, it receives interference from Wi-Fi etc. reaching only a few meters, the connection may be lost and the alarm may sound even if it is nearby. if the Bluetooth on the smartphone side is bad. Please be aware that the performance is different from car keyless entry. Tradeoff between stability and search range. In order to stabilize in the 2.4 GHz band, it is necessary to use a Bluetooth tag with high output. On the other hand, if you use a high output Bluetooth tag, the search range you need becomes wider. It is not suitable for things that you do not usually carry with a smartphone. Bluetooth loss prevention tag needs a link with a smartphone. it is not possible to set the alarm at the disconnection. average evaluation is surprisingly bad, and the following problems are pointed out. Of course there are also good goods, so let's select a good product with reference to product reviews. The connection is broken even if it is near, and a warning beep sounds. This is largely due to Bluetooth radio characteristics . Cannot be connected with a smartphone. but it seems that sometimes it does not correspond depending on OS version. Let's check supported OS and version before purchase. Let's select products by referring to product reviews. Cannot understand how to use it. The manual is only in Chinese. Just putting it in a bag, the button will be pressed. Attention is required for the item with the button protruding. There is no universal lost prevention measure. and DENSHISUZU etc depending on the item.